Mixed materials make the look of this swivel stool stand out in your decor. 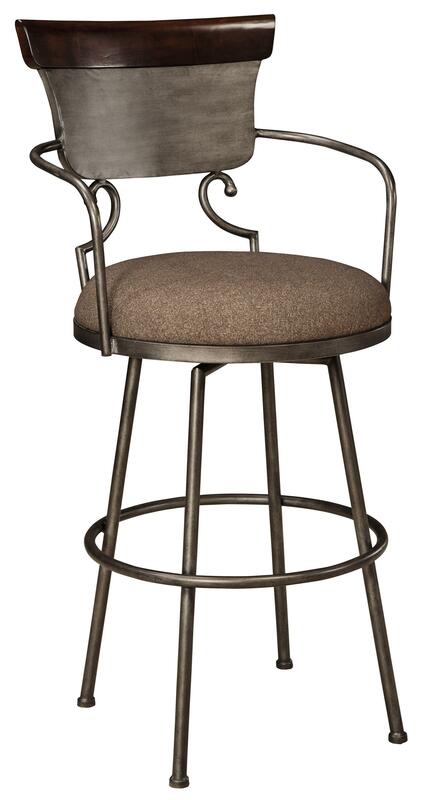 Made from metal in a dark brown brush glazed silver color, the tall bar stool features scrolling arms and a circular stretcher. The swivel seat is upholstered in a dark brown textured fabric for comfort and style. 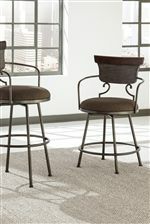 The tall bar stool also has an accent wood cap rail in a dark brown finish. The Moriann Tall Upholstered Barstool with Metal Frame & Swivel Seat by Signature Design by Ashley at Sam Levitz Furniture in the Tucson, Oro Valley, Marana, Vail, and Green Valley, AZ area. Product availability may vary. Contact us for the most current availability on this product. The updated styling of these barstools make it easy to outfit your dining space. Take your pick of the options available and find the size that is right for your home. The Moriann collection is a great option if you are looking for Transitional furniture in the Tucson, Oro Valley, Marana, Vail, and Green Valley, AZ area. Browse other items in the Moriann collection from Sam Levitz Furniture in the Tucson, Oro Valley, Marana, Vail, and Green Valley, AZ area.